Are you remodeling your bathroom and looking for ways to add a touch of extra luxury and comfort to your new space? There are incredible bath fixtures and gadgets that will make you feel like a king/queen, that you probably don’t even know exist! 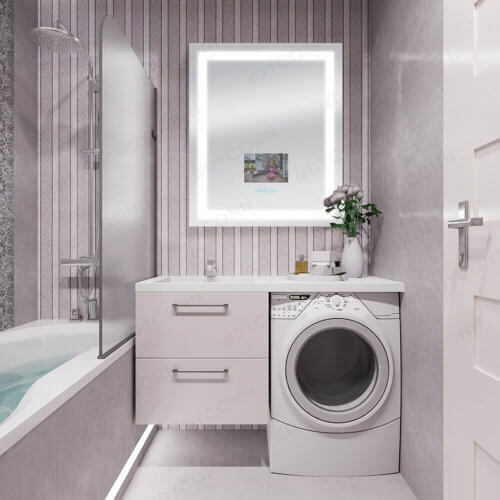 From electronic bidets and touchless faucets, to heat lamps and showers with LED lights, there are many cool products designed with the latest technological innovations for maximum comfort and style. If you are ready to splurge and be pampered like royalty, check out out list of the 10 most upscale bathroom fixtures. (Note, all prices on Amazon listed here are subject to change without notice. Click on each product to get the updated cost). Undoubtedly, one of the most important fixtures in the bathroom is the toilet. 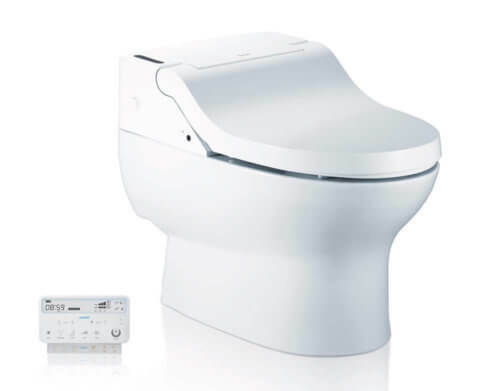 So, here is one that will totally transform the experience: San Souci Touchless Toilet by Kohler. Innovative technology enables you to simply hold your hand over the tank sensor to activate the flush. Also, no need to touch the handle ever again, which means fewer germs to pick up and spread around. Finally, the germaphobe in you can rest in peace! Kohler is a leading manufacturer of bathroom fixtures offering superior quality and durability products. 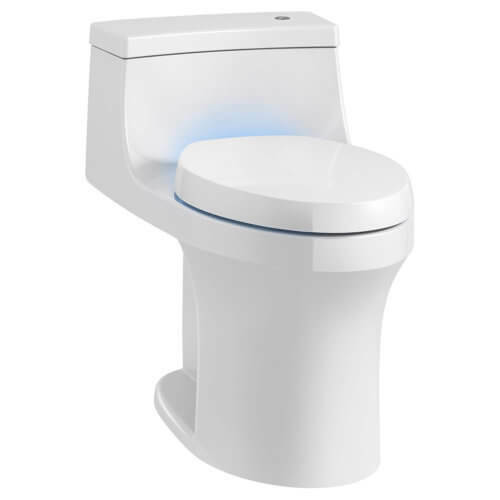 Thus, the San Souci toilet offers impeccable design and comfort, in addition to the very cool touchless flush feature. Installation Cost: Amazon can install the toilet for an estimated $240. Hiring a plumber to do this job will cost the same or more. However, if you can hire a handyman (someone without a licence), you would be charged around $100-150 for the job. 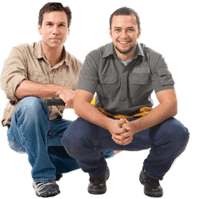 On the other hand, we always strongly recommended hiring only licensed contractors for any type of install. Trying to save a few bucks can lead to bigger problems that will cost a lot of money to fix. If you don’t like to spend time shopping for different bathroom fixtures and trying to figure out if they match well, this upscale all inclusive vanity by Verdana is a perfect fit. It comes with the vanity cabinet, a beautiful sink bowl and a faucet. Also, the vanity is a generous 48 inches with all functional cabinets. 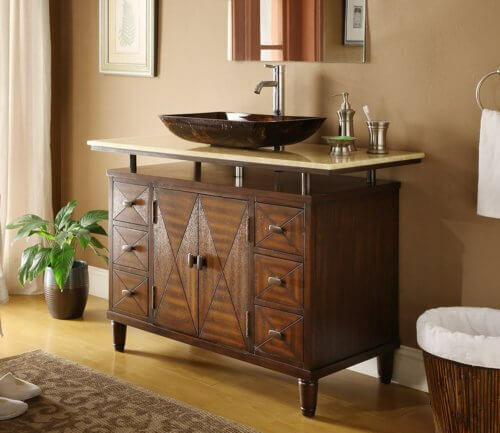 Lastly, the style would look ideal in rustic, transitional or traditional style bathrooms. If your idea of luxury includes sleek, futuristic – looking fixtures, then you will fall in love with this waterfall faucet by Jia You Jia. It is designed with a widespread spout that really makes a stunning waterfall impression. Best of all, this faucet also has changing LED lights that change colors depending on the temperature of the water. 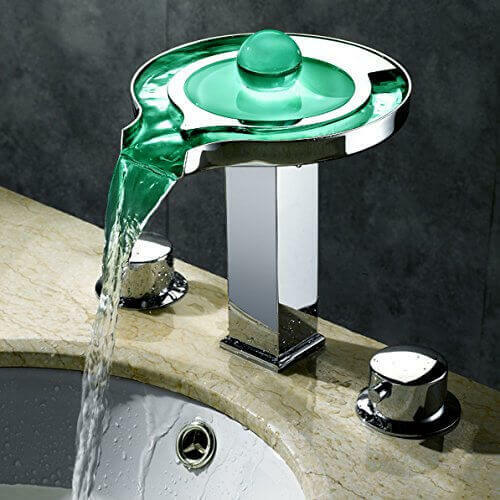 Undoubtedly, this awesome faucet will be envy of your friends, and the delight of your entire family. Installation Cost: Amazon can install the faucet for an estimated $100. If you live in an area with prolonged winters, you would surely appreciate having extra warmth in your bathroom. 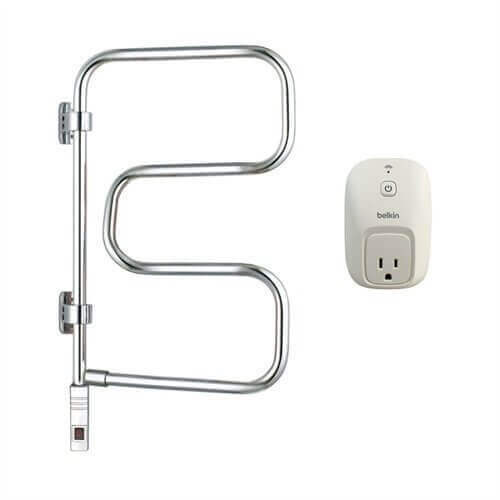 Now you can, with a 4-bar towel warmer by Warmly Yours. It swivels for easy reach and storage and comes with a “Smart” WeMo Switch, which allows you to start it remotely. That’s right, you can warm your towels, ahead of time, right before you decide to take a shower or bath. To feel warm and toasty, install a ceiling heat lamp. Indeed, nothing is more pleasant than to step out of the shower and experience radiant warmth all over your body. 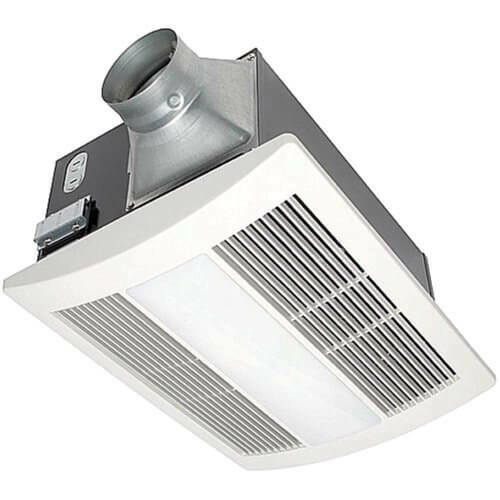 While there are many inexpensive ceiling heat lamps out there, we recommend a brand that can be trusted: WhisperWarm Ceiling Mounted Fan by Panasonic. Moreover, the beauty of this device is that it offers a heat lamp, fan, regular and night light all in one! This lamp is one of the most popular bathroom fixtures sold on Amazon, and people who own it, simply love it. To truly pamper yourself, install a bidet toilet. While many people in the USA still have no idea of the pleasure and cleanliness one gets from washing rather than using toilet paper after going to the bathroom, a few have already discovered this secret gem. 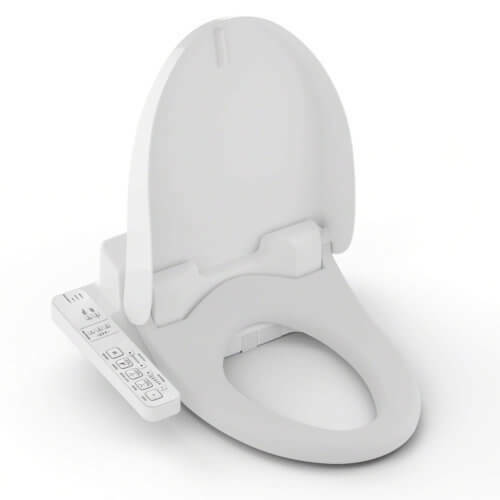 We recommend a Bio Bidet toilet; it will exceed all your expectations! Enjoy a warm water wash with adjustable temperatures, dual flexible nozzles for him and her, and pulsating massage technology with bubble infusion. Truthfully, after you try it once, you will not want to go another day without this bidet. Installation Cost: Amazon can install the toilet for an estimated $240. Hiring a plumber to do this job will cost the same or more. If you can hire a handyman (someone without a licence), you would be charged around $100-150 for the job. If you cannot remodel your bathroom in a way that will include a dedicated bidet toilet, you can still enjoy the convenience and pleasure of the bidet, by installing an attachment on your regular toilet. Now, there are many bidet attachments to choose from, some mechanical, others electronic. We recommend getting the best attachment out there: TOTO Elongated Washlet. In fact, you get all the bells and whistles of a high-end separate bidet toilet, in this sleek looking attachment, for 1/4 of the price! This is one fixture that is a total splurge, but you will not give it up, once you try it. Installation Cost: Amazon can install the toilet for about $175. If you can hire a handyman (someone without a license), you would be charged around $75-100 for the job. 3 temperature settings and 5 pressure settings. If you want to transform your space into a private spa, a shower panel will do the trick. 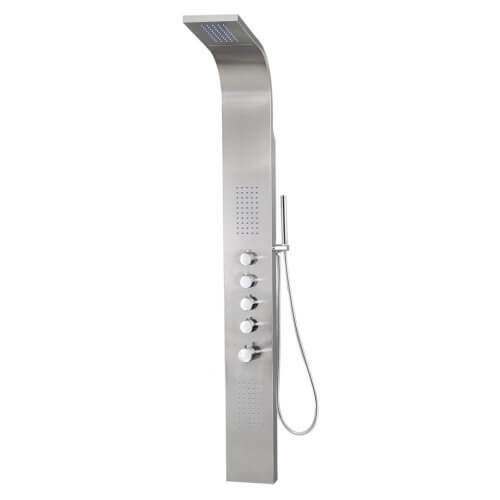 Now, we are not talking about just any old panel, this Decor Star Panel offers an integrated rain shower, massage system with jets and a hand held shower. Your shower routine will be transformed into a truly relaxing get away. Moreover, you will love the stainless steel look and the cool, futuristic design. Indeed, this shower panel will look perfect in a modern bathroom, and would also work well in a dedicated man’s bathroom. How cool would it be to get your news right in the bathroom, as you do your morning routine? Finally you can, with one of the most rare luxury fixtures: a TV built into a vanity mirror. Made by Dyconn, the mirror is a beautiful silver color. It would fit well in any style bathroom, from modern to traditional. Actually, the mirror itself is special. It has 35% more clarity than conventional mirrors, and a built-in anti-fog system. The TV controls are on the mirror itself. Also, the TV has a 10 inch LCD screen, making it a perfect substitute for a tablet. Built In 10″ LCD TV w/ HDMI input, RCA input & USB media player 720p resolution TV. Few things can be more unpleasant that to step on to a freezing cold tiled bathroom floor. However, to solve this problem, you don’t need to install a hydronic floor heating system in the entire bathroom (this is a very costly update). Instead, you can put in a small electric radiant floor heating mat by Warming Systems. In fact, this mat is one of the most useful bath fixtures you can get. It is a very economical and practical solution. Electric mats come in a number of different sizes, so you can find one that best fits the size of your bathroom. Also, installation is easy and a lot less expensive than putting in a hydronic heating system. 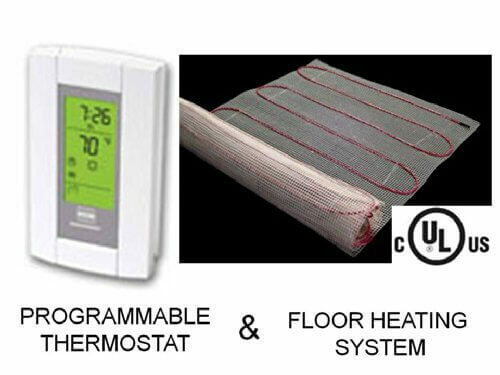 Finally, the mat comes with a programmable thermostat, so that you can set the desired temperature. Installation Cost: Amazon can install the floor mat for an estimated $92. Most likely, a licensed electrician will charge at least 20% more. Mesh can be cut to fit other shapes. That sounds perfect but I have question. I’m guessing but I could get one installed in the kitchen or any room If wanted ya think?